Wrestling without the spoilers. Just news, views and opinions. Here is our weekly RAW Rundown with all the best bits from this week's show. RAW got underway with an esteemed panel of Hall Of Fame Legends discussing John Cena's chances in his upcoming rematch with Brock Lesnar. Shawn Michaels gave Cena no chance. Ric Flair gave Cena no chance. 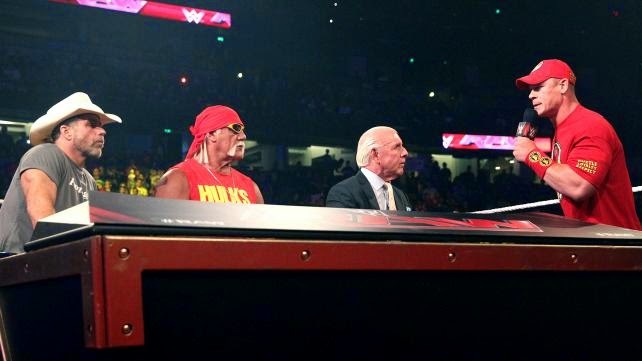 Hulk Hogan thinks Cena is going to win. Brother. Cena rudely interrupted the Hulkster to proclaim that he is going to be the one issuing the beating at Night Of Champions. In the first match of the evening Rusev defeated Jack Swagger AGAIN - This time picking up the victory via stoppage. Surely this has to be the end of the feud now? It is getting a bit embarrassing for Swagger. Even worse now that Bo Dallas appears every time he loses! Next up, it was a Number 1 Contender's Match for a shot at the United States Championship, currently held by the Celtic Warrior, Sheamus. The match was contested between RVD and Cesaro and given the fact that Cesaro and US Champ Sheamus had an altercation on Main Event last week, it seemed obvious Cesaro was going to pick up the win. Next - Paige took on Natalya in a non-title match. Having won the previous two encounters, Natty was looking to make it three in a row against Paige. Unfortunately this time it wasn't to be and Paige picked up the win. However we just found ourselves just waiting for the AJ Lee theme music to hit at some point. Last week Dean Ambrose had his head smashed THROUGH concrete by Seth Rollins at the end of RAW. Goldust & Stardust (or Gold & Stardust as WWE have now renamed them, like it matters!) are now bona fide bad guys. BOO! They took on the Usos for the WWE tag team titles following on from a recent non-title victory against the reigning champions. Things were looking good until one of the Uso twins (no idea which one) got themselves counted out - Thus retaining the titles by default. The Rhodes brothers were not best pleased by this and decided to issue the Usos a good old fashioned baddie beatdown. It was supposed to be a heel turn, but the crowd were really poor all night and they hardly reacted, which was a shame. The rematch should be good now with a bit of extra heat and we're still backing the Golden ones to become the next tag team champions. Next up it was Dolph Ziggler vs The Miz! Wait. Haven't we been here before? Only about 100 times in the last month - Well, that's how it feels to us anyway. Whoever said that Brock Lesnar is a part-time champion? Far from it! In previous weeks we have been particularly scathing of the acting abilities of the Bella Twins. In our defence, It think that we have been justified to hold those opinions. But we can also eat humble pie when necessary and that is why we are laying the table and folding up the napkins right now - Because their segment last night was by far the best bit of the show! In particular the plaudits have to go to Nikki Bella who played a brilliant heel last night. Bravo! Following on from the earlier brawl between Roman Reigns and Seth Rollins & Kane, a handicap match was scheduled between the three of them. The idea was for Rollins & Kane to "finish" Reigns in the same way they did to Ambrose last week. 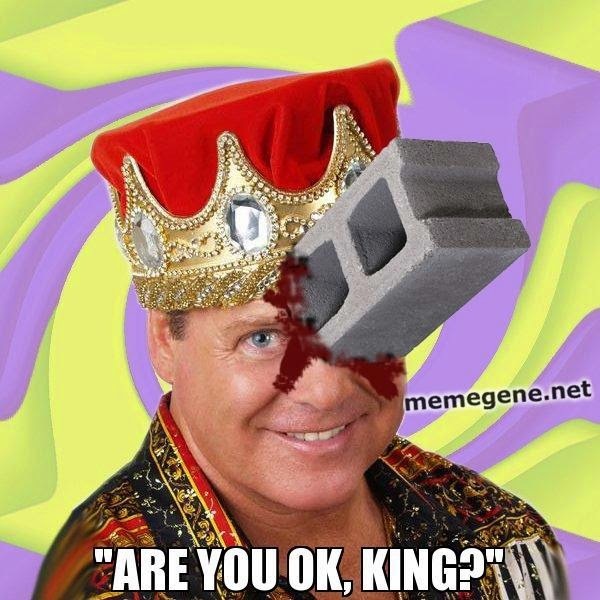 Jerry Lawler's bad evening continued as a fragment of the block headed toward his direction at the announce table. Good job it didn't hit anyone in the crowd, eh WWE? Now, at this point we were quite enjoying RAW. Some people were already voicing their displeasure via Twitter, Facebook etc - But for what it's worth, we thought everything was fine up to this point. But then things went downhill. Fast. Los Matadores vs Slater Gator, followed by Kofi Kingston vs Bo Dallas. For a minute we were wondering if we had tuned into an episode of Main Event by mistake. These two matches (basically designed to fill time) are perfect examples of why sometimes a three-hour RAW is too much. We wouldn't have minded so much if the main event had been worth the wait. But sadly it wasn't. John Cena went head to head with Bray Wyatt in the main event of the evening. We were hoping for something similar to their excellent 'Last Man Standing' match at Payback. Our hopes were misguided. Cena basically squashed Wyatt in a near mirror image of what Lesnar did to him at SummerSlam, before the other members of the Wyatt family got involved and stopped the beatdown. Then the World's Biggest Tag Team, Big Show & Mark Henry ran (waddled) to ringside to save Cena. As the brawl ensued WWE decided to take an ad break which seemed to take even Michael Cole by surprise! When RAW returned after the ads, it was now a six man tag team match! All of a sudden Erick Rowan, Luke Harper, Mark Henry and Big Show found themselves in the main even of RAW - How the HELL did that happen? Was it meant to happen? Did WWE screw up their timings? Anyone care to explain? Because the end of the show was as messy as anything we've seen for a good while. Cena, Henry and Show picked up the impromptu win in the end and then Cena AA'd everyone in sight to round off a very mixed episode of Monday Night RAW. Orton, Triple H, Steph, Ambrose, Jericho, Heyman, Lesnar et al - PLEASE come back ASAP!